Chris Moen felt sluggish. He couldn't get loose. He couldn't get moving. He wished that he had warmed up more. When he got the baton in the 3200-meter relay, he was in no-man's land. He moved by a Linganore runner to move into third place, but he never felt like he was in the race. He finished in 8:09, the fastest relay he had run on since his freshman year. But if he couldn't get loose by the time he lined up for the open 800-meter run, his entire senior indoor season would be a waste. Olivia Ekpone crossed the finish line in the 300-meter dash in 39.49 seconds, over one second faster than the next girl. She moved to the side and watched as Eleanor Roosevelt's Doris Anyanwu finished the next heat in 39.34, claiming the 4A state title. For the first time this season, she lost a race from another heat. If only she had run faster at regionals�if only she could have hugged those Armory turns a little tighter, she could have been in that fast heat and challenged for the win head-to-head. This wasn't her year and she still had 3 more races to run. And so she moved on. Ekpone may be a freshman, but she is no newcomer to dusting people on the track. All season long, she lived up to the expectations that she brought from her youth track career. She proved herself as decisively faster than any Montgomery County girl, but the real test would be how she would fare against the quickest speedsters that Maryland has to offer. She lined up in the blocks for the 55m dash with no state titles to her credit. She breezed through the trials, breaking the previous state record of 7.08 with a time of 7.07. In the finals, she lined up against Krystin Lawson of Wise High School, the only girl in the field to post a time as fast as hers before today. When the gun fired, she stood up tall and punched her arms forward. Seven seconds later, she crossed the finish line, 0.12 seconds ahead of Lawson for her first state title. Her time of 7.05 broke the previous state record by 0.03 seconds. Ekpone earned her first state title, but her day was only half over. She went on to anchor Wootton's 800m- and 1600m relays. In the 800m relay, she successfully raced down a few teams and helped the team to 3rd place in 1:45.43, the fastest time by a Montgomery County team this year by nearly 3 seconds. 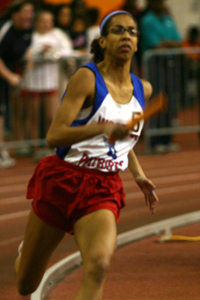 Similarly, she gave Wootton a big boost in the 4x400, helping them to 4th place in 4:07.80. Chris Moen had another shaky start to this indoor season. He flopped in an early season 3200-meter run, and later struggled in the Montgomery Invitational elite mile. But at the Montgomery County Championship, he broke the county meet record in the 800. Since then, he has seemed unbeatable, but a win today would not come easy. 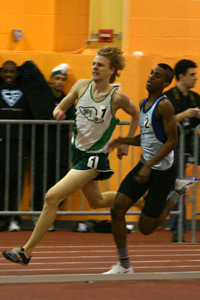 Daniel Edmund of Eleanor Roosevelt had already run 800 meters in 1:56 and 1000 meters in 2:29 this season. Moen had not come within 2 seconds of those times indoors. The race began and he tucked into the front pack. He sat back for nearly three laps, letting others lead the pack through the first quarter in just over 60 seconds. In a way, he felt lucky that the race developed this way. He didn't exactly have a plan in mind and nobody was running away with it. As he approached the starting line with 200m to go, Moen began to push the pace with a burst of speed. Edmund also picked up the pace and led Moen for the next 100m. In the final 100-meters, Moen pulled away with a slim lead, but Edmund would not go away. Both runners gutted it out with whoops and cheers from every end of the field house. Moen crossed the line in a state meet record 1:56.77. Edmund was 2nd in 1:57.31. Moen did not rejoice. He did not celebrate. He did not smile. This victory marked his 3rd individual track state title. Unlike the first two, this one was not much more than a relief. It had been over a year since he won a race of this caliber. The last 200-meter lap was possibly the toughest lap he has run in his career, but his strength was there when he needed it. The best news is that, unlike last year, he felt just fine afterwards. He wasn't drained and he wasn't exhausted. Yes, he gave 100% for the win, but he could bounce back and do it again today, or tomorrow, or next week. Unlike the Moen that we saw win last year's 1600-meter state title, before struggling for 2 months, this Moen is just getting started, and the entire state knows it. Two MoCo athletes set state records at this year's indoor track state championship. One is old and one is new. Both are just getting warmed up. Chris Moen is really a great runner. I'm so glad he's getting back into it. Edmund's 800 in the 4x8 was sick, I wish he would've anchored.